If you are a professional decorator or simply a design and decor enthusiast, you ought to visit this stylish and sophisticated shop! Conveniently located in the central Clarke Quay area , Frangipani Homes specialises in new and timeless Asian furnishings made of natural and refined materials. Praised for its solid reputation and experience in creating the perfect living atmosphere, Frangipani Homes helped since 1997 many individuals, interior designers and developers to furnish homes, showflats and restaurants. Here, most of the furniture on display are made from Indonesian, Thai teak and mahogany woods, which are particularly sought after not only for their warm and rich look but also for their density and extreme durability. With its even grain pattern, reddish brown shade and rich warm glow, the mahogany pieces found here such as coffee tables and benches, make a striking feature in any room. Frangipani Homes also engages in offering a large gamut of teak furniture. Teak wood is particularly popular for its many qualities. With its high oil and rubber content, it repels moisture, sun fading and termites. When treated or varnished, teak pieces come in a stunning dark and deep dye. At Frangipani Homes they include cabinets, bookcases, wardrobes, daybeds, dining sets and several magnificent four-poster beds. On the other hand, the natural teak furniture, which take on a gray patina and smooth texture, have been the much-desired choice as garden furniture for decades. Cabinets, benches and other outdoor dining sets found at Frangipani Homes will blend beautifully with the outdoor setting of your garden patio or add a country-style touch to your interior. Some other highlights of the furniture offering include Chinese and Indian antiques and a contemporary collection of drawers, stools and lounge-chairs from India, which uses goat fur as a trendy eye-catcher. Frangipani Homes is also the place to go if you're in need of a stylish design accent. 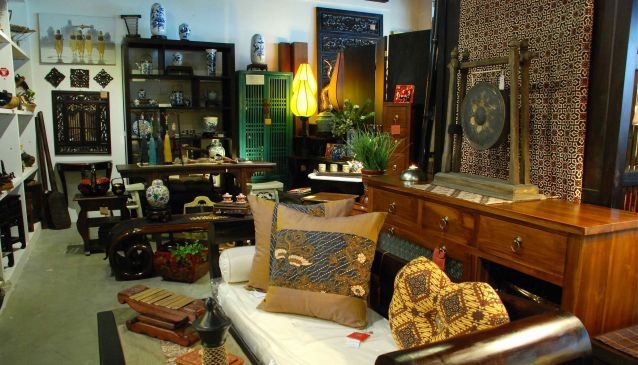 Its appealing showroom is filled with plenty of lovely decorative items and artworks from China, Thailand, Indonesia, the Philippines, Vietnam, Laos, Cambodia, Myanmar and India: pottery, porcelain, candle holders, bird cages, vases, lamps and soft furnishings, but also all types of statues and figurines such as Buddha heads, reclining Buddhas and Indonesian puppets. Frangipani Homes also provides oversea shipping and custom-made furniture services, creating the bespoke furniture that will suit your taste and your space. At Frangipani Homes, you'll find all the inspiration you need to enhance or reinvent your home with an exotic feel. From the smallest decorative item to the largest teak piece of furniture, they will all sit effortlessly in your home with today's living in mind. Watch Frangipani Homes' video, virtual tours and photos and get an idea of what to expect.